It all started with a status. From this, a friend inboxed me and mentioned Patreon, and the beginnings of an idea formed in my mind. I want to provide the gift of beautiful photography to the families of children that have life-changing conditions, or who are in long term foster care, or other similar situations, free of charge. And I think it is possible! But I need your help. Hello! I am Donna. I am a mum of two beautiful children (yes, I have too many photographs of them) and wife to a gorgeous Irishman. I listen to many kinds of music, from brutal death metal through to rap and hip-hop. I have too many tattoos but always planning more! If you're the nosy type (just like me!) feel free to go and look around my personal facebook page here, don't be shy! I am also known around the internet as ClickClickBang Photography. 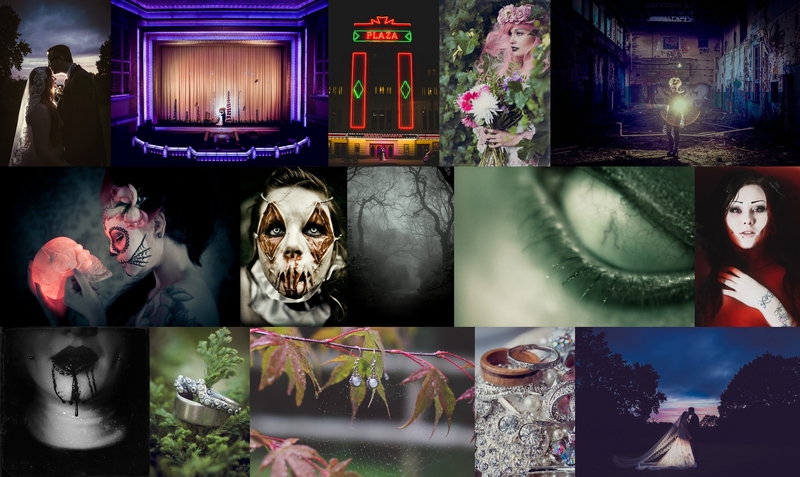 I shoot all sorts of things, from weddings and babies right through to fine art and horror. Heres a little collage of some of my favourite images from the past few years so you can get a feel for what I'm about! I am a sometimes full-time sometimes part-time photographer as my own health isn't brilliant, so if I'm not being a photographer, or being a mum and wife, I'm generally being ill (and sometimes feeling sorry for myself!). Fibromyalgia, chronic migraine and bouts of depression all take their toll, I manage well but it means I have very little spare time, and what little spare time I have I try to put to good use by looking for paying clients. This means that the free sessions are few and far between as I don't have enough spare time or money to do them, and I want to change that. So what I am proposing is this; If I can get enough support, I can stop searching for paying clients, and instead I can concentrate my time on providing photography for people that deserve it, both in and around Lancashire (where I live) and, depending on how successful my pledge is, throughout the UK. For example, If 1000 people pledged £1 a month, that would still work out less than full-time minimum wage here in the UK but it would enable me to stop searching for paying portrait clients and to be able to photograph 1 session a week at my current portrait session rates. I honestly think thats doable. Lets put it this way: Peter Wanless, CEO of the NSPCC, earns £162,000 per year. Nine executives at Cancer Research UK earn more than the Prime Minister, including chief executive Harpal Kumar, who pockets up to £240,000 a year. Amnesty International's Salil Shetty, pockets a salary of up to £210,000, and Tom Wright of Age UK, earns up to £190,000 a year. 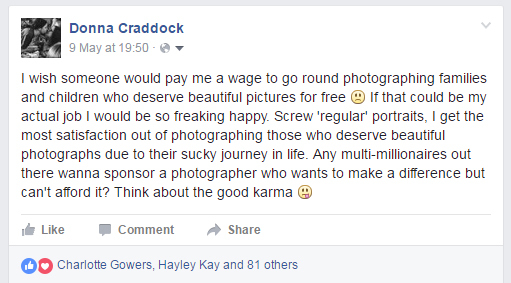 I'm aiming to get £12,000, which (along with my wedding work) will pay my bills, feed my kids and keep my photography equipment in good repair. I'm not in this for the money, or the fame. I'm in this to do something with this small talent I've been given, this pretty minor ability in knowing how and when to press the shutter button, to give these families something they can treasure forever, at no cost to themselves. OK, I'm not trying to cure cancer. But I think I'm doing something tangible, something worthwhile, and I guarantee the parents of the children I photograph will agree with me. Each family will also have the opportunity to share their story with their images on my blog and established facebook page (if they want to of course) to raise awareness for their situation or the illness that their little one suffers from, alongside blog posts from myself about my journey with Fibromyalgia and brutal honesty about being a Mum with severe, recurring depression. I want to bring these things out to light, so others can see they aren't alone and that there are other people out there dealing with the same issues. I honestly believe that being open about such things can make a real difference to someone elses life, in fact I don't believe it, I KNOW it. So tying my own story in with the stories of others seems like the right thing to do. You in this with me? Every one of my patrons will be credited by name on a very special page on my website and on my facebook page. Karma points, guys. Don't turn your nose up at karma points. Exclusive access to content before everyone else (with the families permission of course!) so you can see what your funds are achieving. 10% off any prints and jewellery in my Etsy store! Exclusive access to brand new ClickClickBang Art shoots before they go public, behind the scenes and before/after shots. The dollar equivalent of £250 will allow me to photograph one family per month at no charge.